The Harley-Davidson Street Bob is a motorcycle that caught my eye as I was trawling through a Harley showroom a few weeks back. Using a Dyna chassis, not overly expensive and fairly minimal in design and accessories, this is a fairly easy motorcycle to mount mobile electronics to. The photo that accompanies this article is of a Harley-Davidson Street Bob cockpit. The first thing that hits me is all that handlebar space. That’s the best place to mount a phone, GPS, camera or drink holder. The clutch is fairly high up because of the handlebar shape so I’m recommending the handlebar mount. I think the Harley-Davidson Street Bob clutch is too high for mounting anything. The diameter of the Harley-Davidson Street Bob is standard. It comes in at a standard 1.25 inches in diameter. Pick your side. You can mount one or more devices or holders to these handlebars. I used to open motorcycle mount articles with a discussion about GPS devices. With the advent of excellent GPS apps for smartphones, these devices now outnumber GPS units so I’ll start the mount discussion with those for smartphones. By the way, if you haven’t tried it, check out our Waze review. I think that’s the best GPS app out there. Be sure to use a good case like an Otterbox Defender or LifeProof case to protect your phone against road debris. The small investment will help to protect against potential damage to your expensive phone and it’s worth the small investment. It’s important to select a mount with a well constructed cradle that is going to hold your phone tightly. It needs to stay secure in high vibration environments like a motorcycle. let’s take a look at some recommendations. 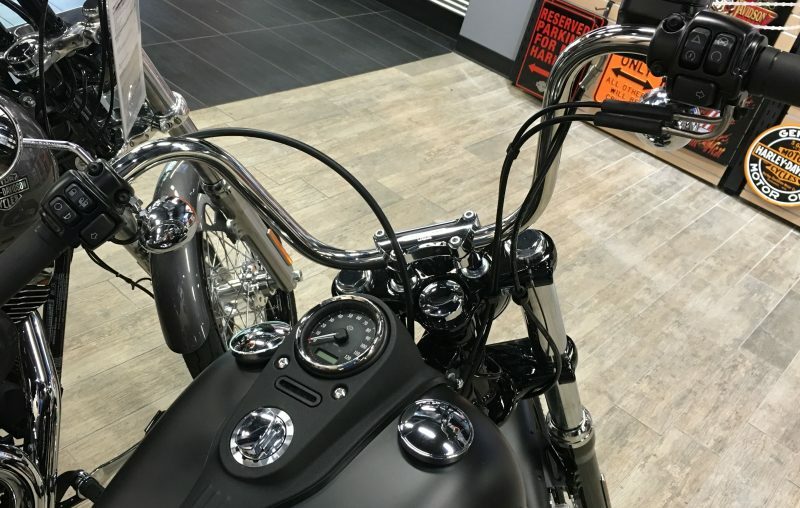 We’re recommending our go-to phone mount on the Harley-Davidson Street Bob. The RAM X-Grip line of mounts continues to a be a favorite for motorcycle use. Most smartphones, especially with a case or skin, can use the RAM X-Grip IV Handlebar Mount. These are heavy duty mounts that are mostly made of metal. These mounts feature the expandable X-Grip IV cradle which can open to 4.5 inches which is large enough for almost any smartphone with or without a case or skin. These mounts attach to the handlebar and allow complete 360 degree rotation of your phone. The manufacturer now includes a safety tether with these mounts which is appreciated. These mounts come with a lifetime warranty from the manufacturer. We wrote a very detailed article on the X-Grip series which you can read here. The mount has gone through some rigorous shake tests and holds up well on a motorcycle. I like using the above mount for a lot of GPS devices too. It will fit most Garmin Nuvi and Drive units up to a 5″ screen size. Most GPS owners are using a Garmin GPS. Either a Garmin Zumo or one of the car models like a Garmin Nuvi or Garmin Drive. The Zumo includes a RAM motorcycle mount that will attach to your handlebar or clutch. The Garmin Nuvi or Garmin Drive models use a cradle that has a 17mm socket on the back. You will use a mount that has a 17mm ball on it. We recommend tethering the GPS to your handlebar for added safety. Read more about GPS and Smartphone Tethers. A good handlebar mount is the Arkon Premium Aluminum Motorcycle Garmin GPS Motorcycle Mount. These will fit your Harley-Davidson Street Bob handlebar just fine. It has a 17mm ball on the end that fits a Garmin Nuvi or Garmin Drive’s socket on the back of the cradle. It’s made of metal and installs with an included hex wrench. Keep the wrench in the saddlebag when finished because you will lose it if thrown into your garage toolbox. This mount has a 2-year warranty. A nice choice for an action camera is the RAM Handlebar U-bolt Base with Camera Adapter. This is a metal mount that fits the Harley-Davidson Street Bob handlebar. There is a standard 1/4″ – 20 threaded camera adapter on the end to fit the tripod screw hole on the bottom of many action cameras. Like all RAM Mounts, these also come with a lifetime warranty. GoPro enthusiasts can score a similar setup with the RAM Handlebar U-bolt Base with GoPro Adapter. Stick with a handlebar mount on the Harley-Davidson Street Bob. Stick with a well made mount and be sure it fits the 1.25 inch width handlebars. Be sure to get everything setup before starting your ride and refrain from interacting with any device while driving.